A polar tracking path line displays from the origin point when you move the cursor close to one of the polar tracking angles. The tracking path lines display as long as the Snap Aperture box overlaps the polar tracking line. In 3D views an additional tracking line displays parallel to the Z-axis of the current UCS. Snap track lock: to lock a snap track path hit the Shift key. To unlock a track path, hit Shift again: it works as a toggle. Locked tracking paths display in the color defined by the SnapMarkerColor user preference.. The display of the tracking path line is controlled through the TRACKPATH system variable. The color of the tracking path line is controlled through the AutoTrackingVecColor user preference. Tracking paths parallel to the X-, Y- or Z-axis of the current coordinate system (WCS or UCS) display in the color of the axis they are parallel with (defined by COLORX , COLORY or COLORZ variables).. Right click on the POLAR field in the Status Bar, then right click and choose Settings in the context menu. Open the Settings dialog, then expand the Coordinate input sub-category under Drafting in the Drawing settings class. Expand the Snap Tracking settings group. 1: Autosnap marker: If checked displays markers at the snapped locations. 2: Autosnap tooltips: If checked tooltips display. 8: Polar tracking: If checked, Polar Tracking is on. 16: Entity snap tracking: If checked, Object Snap Tracking is on. 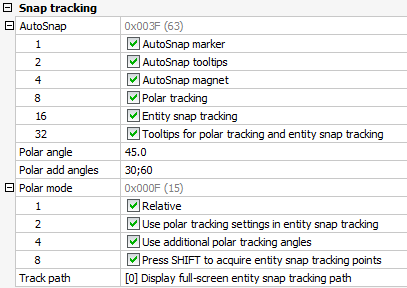 32: Tooltips: If checked, tooltips display for polar tracking and entity snap tracking. Polar angle: Sets the polar angle increment. Polar add angles: Sets the additional polar angles. Separate angles by semicolons. Polar mode: Controles the behavior of Polar Tracking. 1: If checked, polar angles are measured relatively from selected entities. 2: If checked, the polar angles (interval and additional angles) are also used in entity snap tracking. 4: If checked, the additional angles for polar tracking are used. 8: If checked, press and hold the Shift key to acquire entity tracking points. Track path: Controls the display of the polar and entity snap tracking paths. (option) Check the Polar Tracking settings. (option) If not already on, click the POLAR field in the Status Bar. Launch the Draw Line tool. Specify the start point of the line. Polar tracking lines display at the specified intervals and additional angles. A cross marker (X) indicates the current point. Click when the cursor is at the desired position. Type the length of the line in the command bar and press Enter. Turning on Polar Tracking automatically disables Orthogonal Mode. Hit the Shift key while a snap track marker line is displayed to lock a tracking path, any (snap)point that is picked will be projected perpendicularly onto the tracking path. Hit the Shift key again to unlock. A locked tracking path changes to the color defined by the SnapMarkerColor user preference. When Polar Tracking is ON, temporary tracking points can be used to pick points at locations where no existing geometry is available to snap directly to, while you know the desired offset distance(s) from snap points on existing geometry in the neighborhood. TT option: whenever prompted to enter a point, type TT on the command line, then press Enter to define a single temporary tracking point. After the tracking point has been picked, normal command execution continues. Repeat typing TT to enter additional temporary tracking points. TK option : whenever prompted to enter a point, type TK on the command line, then press Enter to define one or more temporary tracking points. When eventually the desired location has been reached, enter the point by pressing the Right Mouse button or the Enter key. Launch a draw command, e.g. Line. Type TT in the command bar, then right click or press Enter. Use an Entity Snap to pick a point on existing geometry. A small red cross indicates the temporary tracking point. Move the cursor in the desired direction. Depending on the value of the POLARANG and POLARADDANG system variables tracking lines display from the first temporary tracking point. When a tracking line in the appropriate direction displays, type the distance from the temporary tracking point. Specify the endpoint of the line. Type TK in the command bar, then right click or press Enter. A small red cross indicates the second temporary tracking point. Right click or press Enter to accept the second tracking point as the start point of the line. Repeat steps 4 and 5 until the desired point is specified, then right click or press Enter to accept the point.